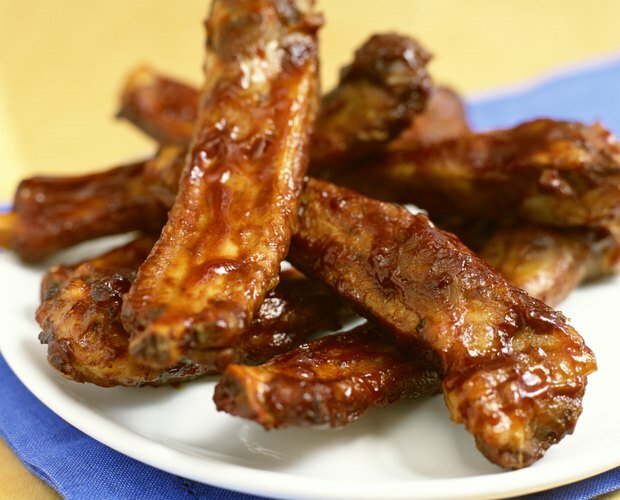 Well-prepared pork ribs are flavorful and tender, with the meat falling right off the bone. Of course, they don't come this way; spareribs and baby back ribs are full of fat and collagen, making them naturally tough cuts. You don't have to marinate them for two days and then slow-cook them all day to get your ribs to turn out great, however. But you do need to steam them before finishing them off on the grill for a perfect barbecued taste. Before you steam pork ribs, coat them with a flavorful dry rub. 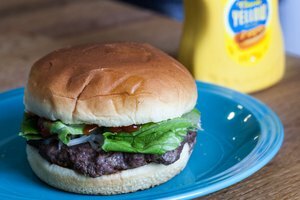 If you don't want to make your own, pick up one of the many meat rubs sold in your grocery store. However, you will have more freedom to tailor the taste if you make your own rub. Start with salt, freshly cracked black pepper, onion and garlic powder, dry mustard and paprika. Combine thoroughly in a bowl, then add more ingredients to taste. Use your favorite spicy chili flakes or powder to add heat. Complement it with some sweetness, too, in the form of brown sugar. Add dried thyme, rosemary, celery seed or other herbs and spices for depth of flavor. Pat the dry rub over all the surface area of your spareribs or baby back ribs. Place them in deep roasting pans or on baking trays. Put lids on the roasting pans or tent the baking trays and ribs with aluminum foil and seal it tightly underneath. Refrigerate the pork ribs for at least one hour, but preferably longer, so the rub's flavors can penetrate the meat a bit. If you got enough of a head start, refrigerate the rubs overnight before steaming them. When cooking time approaches, preheat your oven to 350 degrees Fahrenheit and bring about 1 cup of water per roasting pan or baking tray to a full boil. Take the ribs out of the refrigerator. Pour the water into the roasting pans or, if you're using baking trays, open the aluminum foil a little and pour in enough water to come about halfway up the sides of the trays. Try not to pour water directly over any of the ribs, as this will wash off some of the rub. Put the lids back on the roasting pans or reseal the aluminum foil tightly and put the ribs into the center of the oven. 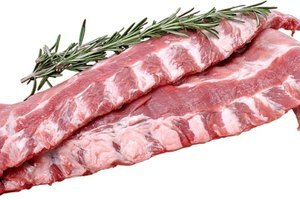 Steam spareribs for about three hours or baby back ribs for about two hours, until the meat is tender. If you stop at steaming the pork ribs, they won't develop the crispy exterior most people prefer. The solution is to finish them by quickly tossing them on the grill. First, let them come to room temperature after steaming. 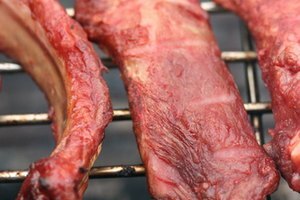 Then, if you're about ready to eat, grill them; refrigerate steamed ribs for up to three days if you're partially preparing them ahead. 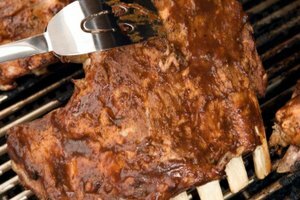 Preheat your grill to medium heat and slather the ribs in your favorite barbecue sauce. Grill the ribs for about 10 minutes, turning them over and basting them with more barbecue sauce about every two minutes. They're done once the outside becomes nicely crisped.